When you finally get time to go out and enjoy yourself you should absolutely make the most of it. We all need to spend more time enjoying what we are doing at this very moment. A hibachi chef turns the rice serving into different shapes with his spatula. When it comes to a restaurant where you can truly enjoy the meal not just for the taste but also for the experience there is no better place to go than Ichiban Japanese Steakhouse, where dinner is the show! At Ichiban Japanese Steakhouse you will have a delicious meal prepared right in front of you by talented and entertaining hibachi chefs. These chefs not only cook an unbeatably fantastic meal but they also put on a great performance! Ichiban is conveniently located at 301 Old Liverpool Road in Liverpool. They are open Monday through Friday from 4:30 to 9, Saturday from 12:30 to 10 and Sunday 12:30 to 9. They are open Monday through Friday from 4:30 to 9, Saturday from 12:30 to 10 and Sunday 12:30 to 9. A tip to Ichiban is always a treat. From the hostess, to the servers and the chefs, all of the Ichiban staff is very friendly and accommodating. If you have never been to Ichiban you should certainly plan a trip soon. They are truly a cut above your average hibachi restaurant. 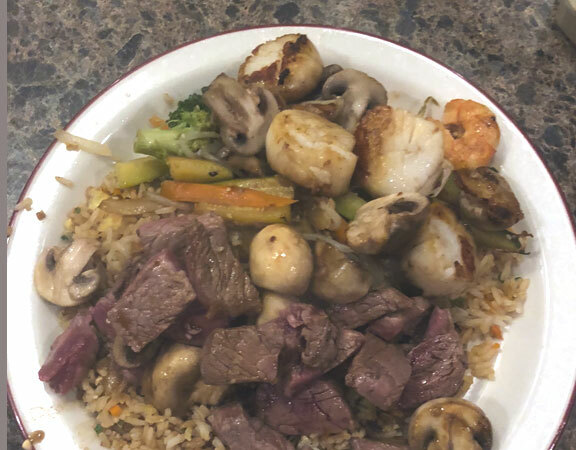 What sets them apart is that they specialize in using the highest quality ingredients to prepare these fantastic meals on the hibachi grill right before your eyes! I will try not to spoil the surprise but it seems like every time we go the chefs seems to have another trick up their sleeves! You can look forward to flaming onion volcanoes burning at the forefront of the grill while the chef chops and cooks the other parts of the meal. You might also see some shrimp tails soaring through the air until gravity runs its course and the tails are expertly caught in the hats and pockets of chefs. Ichiban is a great place for a cozy date night, a group of friends, or a meal that is fun for the whole family! Kyle and I arrived at Ichiban on a warm September evening. As soon as we walked in we were immediately greeted by both a friendly hostess and the smell of delicious food being prepared. It was a busy Saturday night but because we had made reservations we were promptly seated at our table. Our friendly server began by welcoming us to Ichiban and asking if everyone had been here before so that he could explain how hibachi at Ichiban works and what to expect. He also asked if anyone had any allergies so that they could make sure their food was prepared safely. He also asked if anyone was a vegetarian or had any other dietary restriction so that their food could also be prepared accordingly. At Ichiban they are very sensitive to the needs of their guests and pride themselves on being able to accommodate those who may have a difficult time being accommodated at many other restaurants. I have been to Ichiban dozens of times over the years and the servers are always consistent and fantastic about accommodating diners’ food safety and dietary preferences. Freshly cooked filet mignon along with rice and fresh vegetables, all done in front of your eyes! We began our meal with a selection from the Maki Mono (Nori, Seaweed Wrapped Roll) Menu. Their sushi selections are unique and inventive and always both beautiful and delicious. We started with one of Ichiban’s famous sushi rolls, the Crystal Bubble, which is shrimp tempura, crabstick, lettuce and radish wrapped in soy paper and topped with spicy mayonnaise, shrimp, avocado, scallions and sesame seeds. It is served with soy sauce, wasabi and ginger. There is a reason that this gigantic roll is a best seller at Ichiban; it is fresh, crunchy and chewy all at the same time. The mayonnaise makes it slightly spicy but that spice is cooled by the flavor of the fresh avocado. For our entrees Kyle ordered the hibachi shrimp and steak with fried rice and I ordered the scallops and steak with fried rice. We both decided to upgrade the steak to filet mignon for a nominal fee. Our waitress quickly brought out our first course, a cup of house soup, Japanese style chicken broth with noodles. Our next course was a house salad with freshly made ginger dressing. This dressing is just the perfect amount of sweet and tangy, and I dare to say that this ginger dressing is the best in town. That is probably because it is made from a secret family recipe. 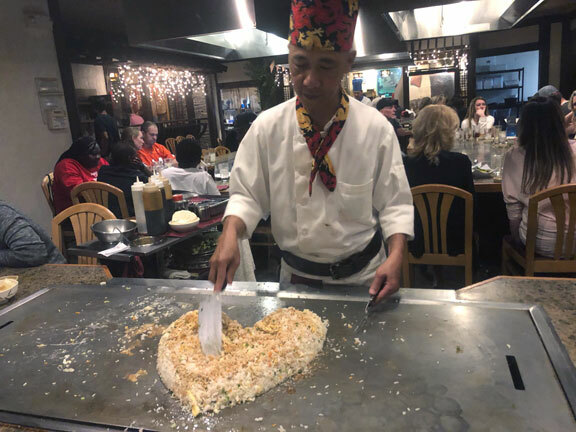 While we were enjoying our first two courses our talented chef was busy making our fried rice look like a panda and then making it into a heart and used the spatula to make it beat. Our chef even cracked an egg by catching it on the side of his spatula. Our chef also began cooking our shrimp flambé appetizer which is also included in the hibachi dinner. While cooking the shrimp our very talented chef caught the tails in his hat, in his pocket and even in a bowl behind his back. Our chef then began cooking the super fresh vegetables. The best part of watching the vegetable cook is when the chef makes an onion volcano and then he lights it on fire! The chef then started cooking the various meats ordered by the people at the table. Everything is cooked to order right in front of you. The ingredients used are the freshest and best quality ingredients available and it really makes a difference in the taste. The meal is also served with a unique and tangy dipping sauce that compliments all of the flavors of the meal. We finished our meal with a delightful cup of black and green leaf blend hot tea. Everything on our heaping plates was extremely high quality, super flavorful and cooked to complete perfection. We enjoyed every bite of our meals at Ichiban and we also enjoyed it again as lunch the following day thanks to the gigantic portions! Because of the scrumptious food and the fantastic show performed by the talented chefs, Ichiban is the ideal place to hold a birthday, anniversary or retirement party. It is also ideal for business meetings and office parties, showers and rehearsal dinners and a great place to celebrate birthdays and anniversaries. To book your upcoming event today call: 315-457-0000. The flaming onion, one of the coolest spectacles during the show! If you have never been to Ichiban Japanese Steakhouse, you definitely have to check it out. 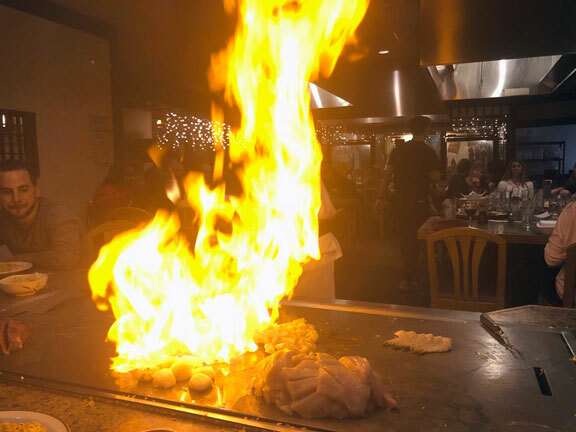 The entire ambience of the restaurant coupled with the show of the hibachi makes Ichiban the ideal place to enjoy a night out! The hibachi tables fill up fast on weekends so it would behoove you to make reservations by calling them at 315-457-0000, especially if you have a large group or need a private room! If hibachi isn’t your thing or you are running short on time they also offer a variety of entrees, appetizers, and sushi rolls at other tables and to go orders are always welcome! 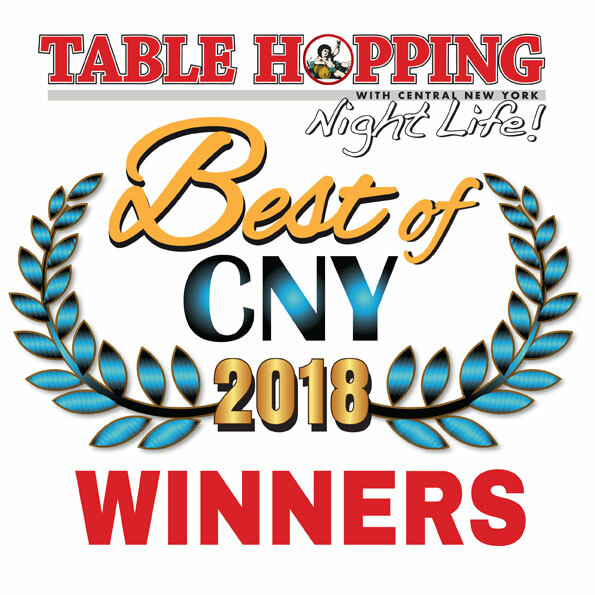 You can also check them out online at www.ichibanjapanesesteakhouse.com and be sure to join their mailing list for specials, birthday wishes, and more! You can also text ICHIBAN to 40518 for periodic promotions delivered right to your phone! Come to Ichiban tonight where dinner is the show!